We have weekly lab meetings, in which one member presents his or her work to the group. This year, to accommodate everyone’s busy schedule, we set the meetings for (ready for this?) 7:45 am on Fridays. To soften the blow I often bake something for the event, but as a result of my cake-phobia, I usually resort to cookies or breads. However, last week I baked a recipe from (gasp) The Cake Bible. Before anyone who knows me goes into shock, let me clarify that this is NOT a real cake. It’s a much safer chocolate bread. The loaf ended on a happy note, but when I was finished baking my poor kitchen looked as if a herd of elephants had blasted through. I’m not sure why I can make bread, pasta or savory pies from scratch, and my kitchen remains neat and tidy. Bake a cake, on the other hand, and it’s indoor tornado season (sigh). Heat the oven to 350F. Prepare a loaf pan (8 x 4x 2.5 inch) by greasing it with butter, covering the bottom with parchment paper, greasing it with butter, and covering the pan with a dusting of flour. Whisk together the cocoa powder and the boiling water until smooth, then let it cool to room temperature. Mix in the eggs and vanilla extract. Add the remaining dry ingredients to a large bowl, and mix on low speed for 30 seconds to blend them together. Add half of the chocolate mixture and all the butter. Beat for 1 minute on medium speed to aerate it. Scrape down the sides of the bowl with a spatula, and beat the other ingredients in two additions, beating for 20 seconds each time. Spoon the batter in the prepared loaf pan, smooth the surface with a spoon or spatula. 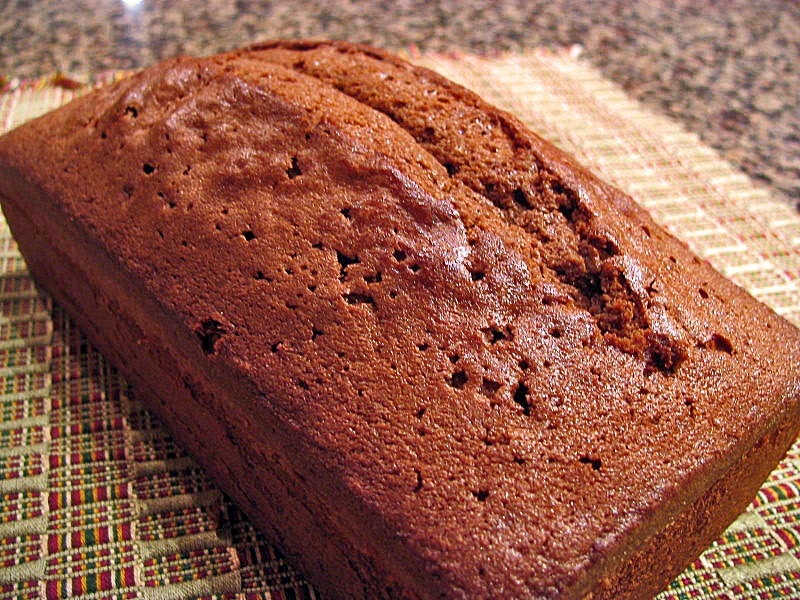 Bake for 50 to 60 minutes, until a toothpick inserted in the center of the cake comes out clean. (Mine took 60 minutes). If the cake is browns too much, then protect it by covering it loosely with aluminum foil. If you want to have a nice slashed look on the loaf, make a cut with a serrated knife 20-25 minutes into baking time, when the loaf will be starting to form a central split. Make the shallow cut quickly, around 6 inches long. 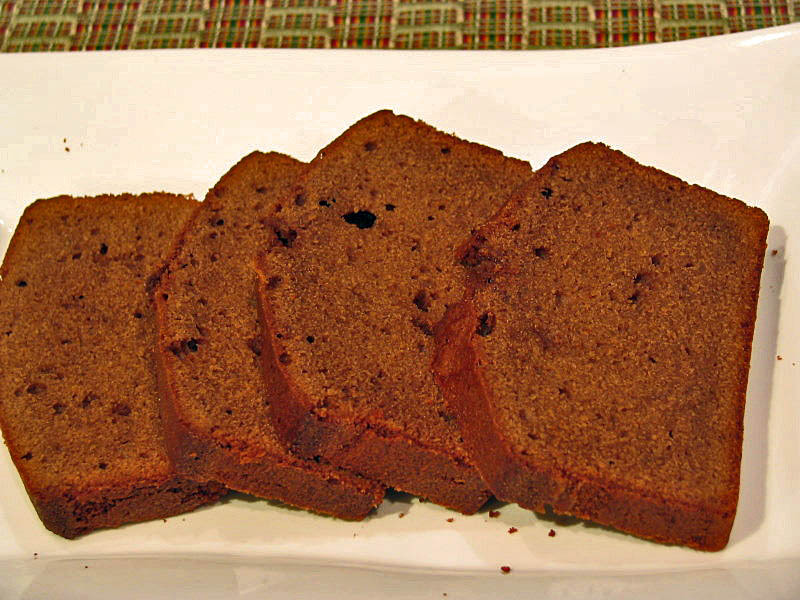 Once the cake is baked, allow it to cool for 10 minutes in the pan, then remove it to a cooling rack. Dust with powdered sugar. Aqueça o forno a 175 C. Prepare uma forma untando com manteiga, cobrindo o fundo com papel amanteigado, e untando o papel com manteiga. Cubra ligeiramente com farinha de trigo, eliminando o excesso. Em uma tigela pequena, misture o chocolate em po’ com agua fervendo ate’ que dissolva por completo. Deixe esfriar ate’ temperatura ambiente, junte os ovos e o extrato de baunilha. Acrescente o restante dos ingredientes secos em uma tigela grande e misture com uma batedeira eletrica em velocidade baixa por 30 segundos. Adicione metade da mistura de chocolate e toda a manteiga. Bata por 1 minuto em velocidade média e incorpore os outros ingredientes em duas adições, batendo por 20 segundos a cada vez. Transfira a massa para a forma usando uma colher grande, alise a superficie e coloque para assar por 50 a 60 minutos, ate’ que um palito inserido no centro do bolo saia limpo. Se o bolo comecar a escurecer muito, proteja cobrindo parcialmente com papel aluminio. Apo’s 20-25 minutos no forno, uma rachadura central comecara’ a ficar evidente. Se quiser produzir um visual semelhante a um pao, faca um corte com uma faca de serra nessa posicao. Depois que o bolo estiver assado, deixe esfriar por 10 minutos ainda na forma, em seguida desenforme e deixe esfriar por completo. Polvilhe com açúcar de confeiteiro (opcional). I manage to dust my counters with a fine layer of flour when I bake bread. I imagine that your coworkers were thrilled with something homemade. Well, I do hope they enjoy it…. I have a lot of fun thinking about what to bring each week, that’s for sure! Lucky lucky colleagues! I hear you about indoor tornado season… and about Johnny Depp too.